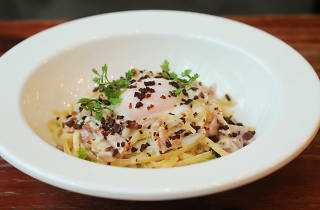 Little Italy Tai Kok Tsui ain’t, so the arrival of ‘Italian’ restaurant Starry Night might raise some eyebrows. If the neighbourhood seems like an odd choice of location, bear in mind its neighbours on Pok Man Street are none other than a range of hip-looking restaurants collectively serving sushi, tapas, ramen, gourmet burgers, yakitori skewers and craft beer. Yes, this working class corner of Kowloon is slowly dusting itself off and ditching its reputation as one only for industry. Stepping inside, Starry Night’s décor – brushed concrete walls, filament bulbs and a print of the Van Gogh painting that gives the joint its name – is unremarkable. The same can be said of the menu, which is mostly a collection of Italian fare – risotto, pastas et al – plus favourites from other cuisines like chicken wings and bacon and cheese fries. In Hong Kong, such an assortment of international culinary favourites usually pressages a restaurant that lacks focus and quality, so we order with some trepidation. We kick things off with the tomato soup ($38), which arrives promptly. The dish is like a hundred other in the city but there’s a nice hint of parmesan and the chopped garlic bread piled in the centre has a pleasantly strong flavour. Our portion of baby mussels ($148 for 500g) is similar, with a formidable hit of garlic complimented by the creamy white wine sauce. For mains we order a fusion-inspired sous vide duck breast with baby asparagus, pumpkin puree, truffle mash and yuzu gel ($128) and the house’s linguine carbonara ($88). The former is attractively plated, a slash of pumpkin runs across the plate and globules of yuzu gel sit placed like stones in a Japanese rock garden. The truffle mash is a winner, perfectly smooth and not overpowering. The duck itself is crisp and golden on the outside, while the meat is tender and rich. It’s standard stuff but it’s not bad at all. 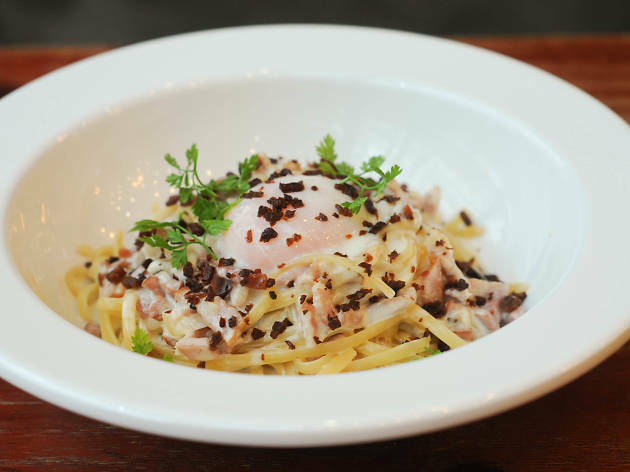 The same can be said of the carbonara, another well balanced if unspectacular dish, which with its 65-degree egg looks particularly Instagrammable. We finish with the decidedly French chocolate fondant with vanilla ice cream and mixed berries ($58). Thoroughly serviceable, the dessert is crisp on the outside and perfectly molten within. It goes down a treat with the sleek ice cream. There’s nothing remarkable about Starry Night. It’s not strictly Italian but what it does, it does well. We await the day all Hong Kong restaurants serving a similar grab bag of cuisines take as much care as Starry Night. Olympic MTR station, exit C.